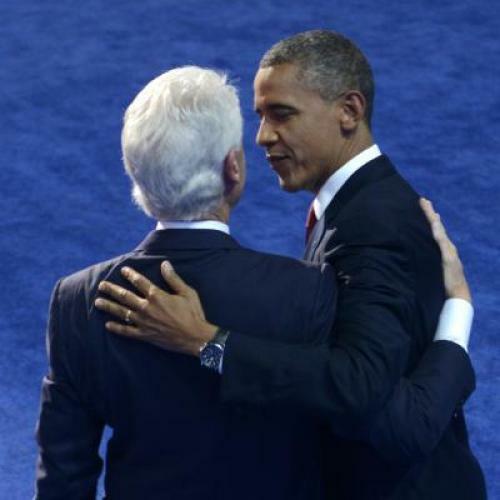 What many feared was correct: Bill Clinton outdid Barack Obama in oratory this week. Clinton pulled off an interesting feat: making an information-rich convention speech. He resisted the crude, sound-bite rhythm expected of such addresses, holding off much of the applause, almost seeming to despair that the audience’s standing ovation tic might derail the points he was trying to make. And that was just it: He had points, often extended ones, in defense of Obama’s achievements. Here was the speech-as-lecture that was so typical in an earlier day, almost reminiscent of Woodrow Wilson making a detailed case for the League of Nations in high professorial style. Yet his address felt not the least bit overstuffed or pedantic, nor did it err into the opposite excess, that of chattiness. One of his 1990s speechwriters once said, “There is no one who is more easily articulate in my memory and I can’t remember a thing he said,” but there was much memorable in this speech. Lines such as “We can’t afford to hand the reins to somebody who will double down on trickle down” and “It takes some brass to attack a guy for doing what you did” will stick in minds. But of more lasting importance is that Clinton made the most compelling whiteboard case for re-electing Obama that anyone of note has made—orally or in print. His Southern accent only helped send the speech over the plate, lending an air of warmth and sincerity that was key in getting him elected 20 years ago. Many assume that a Southern accent signals stupidity, but in our era, vernacular cadences are an aural emollient to American ears. A twang reads “real.” In 2012, he who exhibits a command of facts in the accent of a country-western singer becomes the closest thing we have to a philosopher king. That’s the way many of us used to feel about the current president. Four years ago, when teaching Plato’s Republic, I noted that Obama came up quite often as a possible example of the almost supernaturally wise kind of ruler Socrates described. Yet Obama has not been the communicator we expected. Why, for example, has he not himself been more inclined to make extended cases against the Republicans, rather than throw potshots while avoiding using his rivals’ names? “Defensive,” many would call it, such that many are saying that Clinton did for Obama what the president could not have. And Obama has, in fact, gotten down to specifics to a certain extent in his speeches over the past year or so. But one cannot imagine him taking it to the level Clinton did. “Think about this…” Clinton often said before launching into a disquisition. Obama is less inclined to that mode—does he think it would sound too teacherly or condescending? He should rethink. He’s older now, for one, no longer the “skinny kid with the funny name.” He ventured at one point that being American is to cherish not only rights but responsibilities—but followed it up with gauzy scenarios, speechifying, rather than taking the occasion to highlight the value of this notion of the social contract and how America began as a unique opportunity to put that idea to the test—an opportunity the Republicans are besmirching in the name of being more “American” than he is. It could have been grand. Not that Obama didn’t address the “un-American” graffito that the Tampa event scrawled upon him. Heralding a return to an America all about “products stamped with ‘the three letters USA,’” emphasizing a strong military, charging that the Romney/Ryan philosophy is "not who we are," he made all further claims that his approach to governance is somehow foreign and unpatriotic automatically qualify as nonsense. Dinesh D’Souza looks all the more a crank as of tonight. Yet what we now know as the “Obama style” has never seemed so un-arousing. The future that looked so stirring from the vantage point of the Grant Park speech turned out to be driven to a dismaying degree by the likes of decidedly unstirred personages such as Mitch McConnell and John Boehner. His final passage, packing in journey, path, road and travel, followed by “pull each other up” and “eyes fixed on” was lovely in itself. It moved, in the physical and emotional senses of the word; the bit about the eyes evokes eyes on a certain prize, especially one on a mountaintop, and specifically one that a certain prophet named King told us that he saw, although he might not get there with us. When it’s all over, we’ll either have a President Romney or a second Obama administration hobbled by people like Paul Ryan. And for those undecided voters who were truly seeking to be swayed, I suspect that Mr. Clinton was the one who made up their minds.